Doorway photos, May 2017, for week of the 22nd to the 26th by Author Scot Fin. Full size slideshow at the bottom of this post. 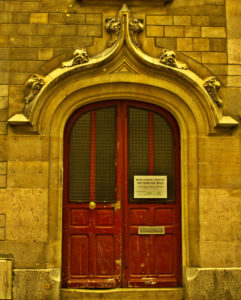 Doorways of Paris; Maison Paroissiale-Presbytere, not the grandest but near the entry to Église Saint-Séverin. Still, I think this doorway has its own character. Just around the corner from a booklover’s important Paris stop, The Abbey Bookshop, it is on the way to the popular pedestrian street, Rue Saint-Séverin. Between this door and Rue Saint-Séverin is the entrance to the Église Saint-Séverin, which is just one more impressive Paris church to see. 2017 photos, May, for week of the 15th to the 19th by Author Scot Fin. Full size slideshow at the bottom of this post. 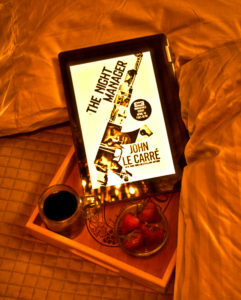 I had heard good things about John le Carré books and then that this one was a BBC miniseries. A miniseries may do better than a movie adaptation of a book but the book was definitely good. I see that the miniseries is available on Amazon and Goggle Play for us in Canada. What I don’t see in any miniseries recaps is reference to the part of the book that takes place in Canada. Hmm. 2017 photography, May, for week of the 8th to the 12th by Author Scot Fin. Full size slideshow at the bottom of this post. One of those weekends again. My wife’s weekend, my weekend. 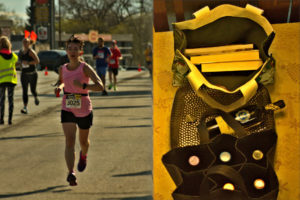 I did, however, share the wine with her … after her race. 2017 images, May, for week of the 1st to the 5th by Author Scot Fin. Full size slideshow at the bottom of this post. 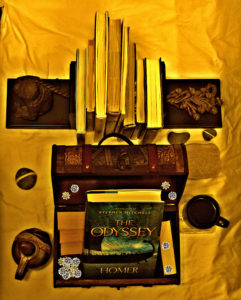 I thought I would grab a cup of coffee and go to my new releases … treasure chest. This one looked interesting; probably some up and coming young writer. First impressions? It might be remembered for a few years.